It started off as a perfect day. The skies were blue and it wasn’t even too hot. Checking the weather before I left the dock, I could tell that we had a chance of rain late in the afternoon, but the chances weren’t very high so I wasn’t too worried about it. We loaded up the boat and left the dock late – around 2:45PM – and headed downriver to Rick’s on the River at Fairview Beach. The ride was as smooth as glass, and it seemed like the day couldn’t get any nicer. After about 40 minutes, we arrived at Rick’s, and I went up on deck to drop the anchor. A dirty little secret of mine was that my anchor rode on this boat previously had no chain, and frankly I wasn’t too worried about it until last weekend at Tim’s 2 when my anchor started slipping. This prompted me to finally add chain to my rode a few days before our departure, and I was excited (in a geeky kind of way) to get to use it on this trip. Unfortunately due to our late start we missed rafting up with some friends. They were concerned about the weather turning, and decided to head back to the marina. I thought they were being a little over-cautious, but who am I to judge? So down the anchor went. After watching the bikini contest and getting some lunch, I decided to check the MyRadar app again. To my horror, the storm was MUCH closer and stronger (mostly red now on the radar app) than I figured it would be! The dark clouds had not yet arrived here, but a quick look upriver told me that the radar was not lying. What’s worse – we were cut off from returning upriver to the marina! I’ve been through thunderstorms before in a previous boat years ago. I remembered it was not a fun experience, and it was the last thing I wanted to go through again. Knowing that my options were now severely limited, I decided that the best course of action would be to leave the boat anchored and ride out the storm on shore. The only problem was that I had some items in the cockpit that I didn’t want to get wet, so I was going to have to make a quick trip back to the boat to square it away. My plan was get aboard, put away the gear that didn’t like water, put up the canvas, and let out a little more anchor line. Then I could go back ashore knowing that I did all I could. I got to the water taxi, and told the driver that I would only be aboard my boat for a few minutes while I made preparations for the storm. He understood, and we made our way back to my boat. After dropping me off, I watched him drive the water taxi a little ways off to wait for me. Knowing I had a way to get back ashore, I confidently started going about the business of storm preparation. It didn’t take long, and once I had all the canvas up I turned around to signal the taxi that I was ready to be picked up. That’s when I realized he had already gone! I thought maybe he had gone to pick up other people, so I climbed up on the bow of my boat to flag him down. It was then that I realized that he was nowhere to be seen! This was not good, because there was still a HUGE crowd at the dock that were still waiting on him to take them back to their own boats. The people on the dock were on the verge of panic. I got on the phone with my friend who was still on shore, and he started looking for the taxi as well. After a good 10 minutes, the taxi finally appeared and loaded up people from the Rick’s dock. By this time, the water had started to get pretty choppy and I could tell that the taxi driver was having a real hard time transferring people onto their boats. I was still on the bow of my boat facing shore when I saw the taxi driver head back to the marina. I didn’t understand why he wasn’t coming for me – until I finally turned around. Bearing down on me was the dreaded storm front – a giant angry savage wall of doom! It had moved in so fast, and the sight was so shocking to me, that it took me a moment to realize what I was looking at. I was screwed. I was in the exact place that I DIDN’T want to be in! I quickly scrambled down off the deck and cranked up the engine. My thought was: If the anchor should somehow fail, at least I could maintain position and steerage. With all my prep work complete, all I could do now was sit there and wait for the storm to hit. There was a few other boats still at anchor and I could see people huddled inside, but I began to notice that most people had weighed anchor and were steering into the coming storm with minimal power. I thought this was probably a better idea, so I started to go back on deck to pull up my anchor too, but it was too late – that was when the storm finally hit us. It started with a violent blast of VERY cold air, and the wind just didn’t stop blowing! In no time, the water became choppier than I’d ever seen it before. 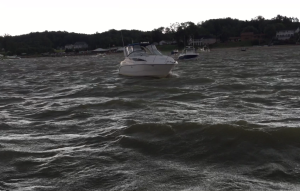 From my position at the helm, it looked like 5-6 ft waves, maybe higher, that were crashing into the bow of the boat. The anchor line strained, but somehow held steady. I looked around at the other few boats also anchored and they seemed to be holding as well – or maybe we were all dragging at the same rate? The shore didn’t seem to be getting any closer for the moment, so that was a small relief. Soon the storm found it’s rhythm and we were getting thrashed by the wind and the waves. It’s a disconcerting thing when you see your bow actually go under the waves numerous times. I wondered how long the boat could take it, and I was worried that the anchor would let loose. I then realized that I may be in a bad spot. The boat was thrashing so hard now that it was impossible to get out on the deck and weigh anchor. If the anchor were to drag or let loose completely, I’d have to drive the boat forward into the wind and waves, while somehow avoiding running over my own anchor line! Too late to consider that now – the die was cast and there was nothing left to do but hold on tight and pray. Always pay attention to the weather, and respect the destructive power of nature. A storm can sneak up on you pretty quickly! Never forget that if you have to rely on a third party for transport to or from shore, that transport may not be entirely reliable. If you get caught in a storm with no escape, it may be better to weigh anchor and steer into the wind and waves under minimal power until the storm passes. It is probably a bad idea to remain rafted up during a storm. Thankfully mine, and the other boats that were anchored with me at Rick’s made it through the storm with no damage. 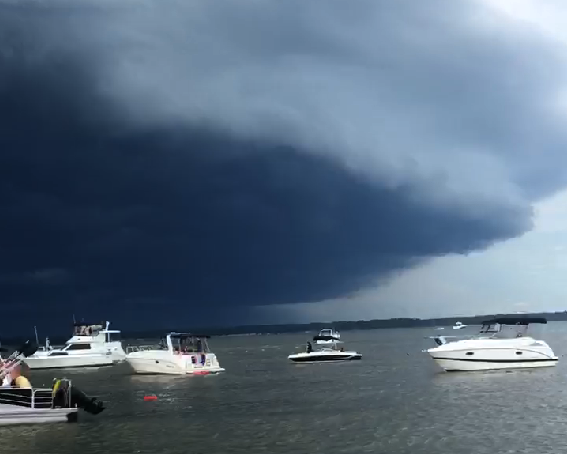 Sadly, other friends of mine who were at Mattawoman Creek were not as fortunate. I’m just glad that nobody got hurt. That was a huge storm, and not one that I will soon forget! Tips and tricks for a good dive! In moving my old blog over to this shiny new home, I ran across my old “Tips and Tricks” page. This is just a simple list of tips and tricks I’ve picked up along the way. I thought it would be a good idea to put them in a single place for all to see. I’ll be adding to these regularly, so stay tuned! When picking up a tank by the valve, make sure you hold it so that the valve opening is facing away from the palm of your hand. This way if your fingers slip a little, you won’t accidentally crack open the tank valve. Trust me, 3000 psi really hurts! Everything underwater should be done in slow motion. 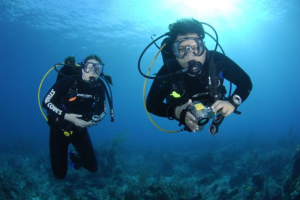 The natural orientation for a diver is horizontal, not vertical. Try not to use your hands. Keep them folded across your chest. All your propulsion should come from your fins. If you have been working hard on the surface or you are just breathing hard, take a moment to relax on the surface before you descend. Scuba is supposed to be a relaxing sport. There is no hurry to get down there. Equalize your ears once on the surface to that they are slightly over-pressured. Cross your fins and keep them crossed, pointed down and slightly behind you. Purge the air from your BCD, and at the same time take in a deep breath. While still purging, exhale completely. You should now be sinking and on your way down. Do not uncross your fins until your body has naturally assumed a horizontal orientation. Do not forget to keep equalizing and letting a little air at a time into your BCD on the way down if you need to slow your descent. Practice this often in your imagination and it will become second nature in the water. Equalize early and often. This means to do it once while you are on the surface before you descend, and then every couple feet or so on your way down. The first 30 feet are usually the hardest. Although the Valsalva maneuver is the one most often taught in open water classes, there exists a number of ways to equalize your ears. If one doesn’t work well for you, just try another. For tips on the many different methods available, watch this video from the University of Washington. Practice equalizing several times a day during your normal work-week and you will find that you can soon do this with very little effort. Time to dust off the cobwebs! We’ve also lost considerable amounts of weight over the winter so we’re likely looking at 2 new 3mm wetsuits too! And of course I have 3 AL80’s and 1 pony tank in need of VIP’ing. 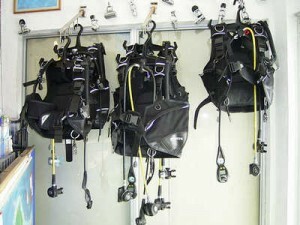 All in all we’re looking at about $500 in expenses just to get us dive-ready! Now we need to pick some destinations! A few years ago we decided to do a different island every year, and there’s no shortage of islands out there. So far as a couple we’ve been to Bahamas, Dominican Republic, Cozumel, and St. Lucia. We could always stay around the caribbean (which I love), or we could branch out a bit. There’s always Hawaii, but I hear the natives hate us. Another option is Belize! I saw an episode of Three Sheets featuring Belize and it looked pretty cool! 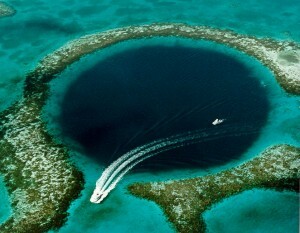 There’s also a blue hole in Belize that I’ve been dying to dive every since I heard of it years ago! Who wouldn’t want to dive that? Besides, my friend Chris once dropped one of my SeaLife Reefmaster Mini cameras down there, so I have sort of a connection with the place, right? Another advantage of Belize is that it’s right next to one of the largest coral reefs in the world, second only to the Great Barrier Reef off the coast of Australia. This sounds like a win to me! Obviously Belize isn’t our only option. There are so many other great islands to choose from. I’ve been to Aruba, but my wife hasn’t. As I recall, Aruba was a lot of fun! Bonaire is also a great destination if all we are looking for is diving, but from what I hear there’s not much of a night life there. Barbados is also on the menu, as my wife once won a trip there that we ended up never using. We’ve both been curious about that island. All I know is, it’s been a long winter and the sooner we get underwater the better! Over the course of several classes, folks have been asking where I got my log pages. 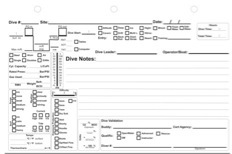 See, these are a LOT better than the usual PADI or NAUI standard log pages you’ll find at your LDS. Some might think its too much information, but I believe you can never have too much info! So where did these pages come from? Well, I sat down and made them. It was a time-consuming project but the end result was worth it. The original idea came from ReefMongoose on ScubaBoard. He had a pretty nice looking page he was designing, but I needed to make a number of modifications. So I ended up just redoing the whole thing using ZeusDraw on my Mac. That being said, here it is! Its a PDF that you have to print on both sides, and then cut in the middle to fit in your typical logbook. Enjoy! It was a busy weekend, thats for sure. Between SCUBA tune-up and discovery dive sessions, I feel like I’ve been rode hard and put away wet. I taught my first SCUBA tune-up class this weekend. It was only two people – thank God – but I was still pretty nervous. See, I’ve never taught anything really, so I wasn’t sure how I was going to go about this. The class started on Saturday. Glancing at my cheat-sheet from time to time, I was able to get though the classroom portion of the course pretty well. We went over dive tables, which everyone just loves to work with. After that we talked some about the dangers of diving, and went into some of the physics. I’d say the classroom portion took about 45 minutes, and then we were headed to the pool. However, there was a power outage at the pool so we ended up postponing the pool session until today. Once we got into the water, things went smoother. I probably could have done a better job of explaining the basic skill drills that we were doing, but they seemed to pick it up really well. At the end of the day, all were happy and had a good time. It seemed like they possessed the confidence in themselves that they lacked before the class, so I’d call that a success. No More Shark Fin Soup! Thank you for your email. We appreciate your feedback and want you to know we have removed shark fin soup from our menu. So that’s good news. Looks like thats the email response that everyone has been getting. It would be nice if we could get some kind of verification of this…. Anyone? Shark Fin Soup in Vegas?!?! “I was recently in Las Vegas and had a chance to stay at the newly opened Palazzo Hotel. There is an Asian Restaurant on the casino floor called Jade, and we decided to try it out. I was shocked to see that they served Shark Fin Soup, given what we all know about the destruction of this creature. :angry: :angry: I spoke with the manager, told him how upsetting this would be to many people, and asked that he remove the item from the menu, but he said it was a corporate decision and that the restaurant is owned by Venetian/Palazzo. So I’ve sent emails to them but have heard nothing back, and now I’m publicizing this on scuba diving boards. Palazzo is a part of the Las Vegas Sands Corp. group of casinos and I’d bet they serve Shark FIn Soup in Macao and will in Singapore too. It’s a public company (LVS) and maybe like Disney they’ll respond to public pressure. There is also a webform for feedback. Recently it has come to my attention that the Jade restaurant, in your Palazzo Hotel is offering Shark Fin Soup on it’s menu. Please don’t mistake me for some PETA tree-hugger or other kind of hippy – I assure you that I am far from that. However, surely you know what a disturbing and disgusting practice shark-finning is. These animals are removed from the water, have their fins cut off, and are dropped back into the water to eventually die a slow death. This would be the equivalent of chopping off the legs of a cow while its still alive, and letting it die a slow death. Would you do this to a dog or cat? Would you do this to ANY animal? In light of these facts, I’m requesting that you remove shark-fin soup from your menu, as it supports the most barbaric treatment of the animals in our oceans. In the end I think you will find that its better for your restaurant to remove this item now, rather than face the hugely negative press that this practice attracts in the near future. I encourage everyone to do the same. This is a truly messed-up practice that needs to be ended. Oh well, it was a fun trip full of relatives and good food. My father, as always, was in charge of the turkey dinner and didn’t fail to impress. It was a world-class meal that left me beyond full, and the leftovers lasted for days. It was good to see everyone again, especially because it seems like we only get together once or twice a year. Had an interesting night at the local bar there, where I ran into someone I knew way back in intermediate school. It was a little odd, as he was able to remember things about back then that I would never have remembered. In fact, it was very odd because he still had all the old yearbooks, and other junk that (I think) most people tend to shed as junk over the years. I mean, intermediate school? Really? Maybe I’m in the minority, but I don’t think a lot about those years. Anyways, to sum it up: Great time, good TexMex food, fun bars, and plenty of relaxation. Can’t complain about that! I’m certainly looking forward to the next time around. Oh ya, and I finally passed Divemaster class! YAY!! !